ME! Everyone has a natural talent. Some people can sing, some can write, some look good, some are funny. Me, I'm a natural slacker mom. It comes easy to me. I don't mean to brag. Really, I don't. But, take today for instance. It's St. Patrick's Day. Little Cat A has been dropping hints for days wondering what the leprechauns would bring or do on this special day. Well, last night at about midnight it dawned on me that I needed to do some "magic". I put a few drops of green food coloring in the kids' potty. Ta da, magic (it was the least I could do, literally). Well, the toilet got flushed in the night, in the dark, without anyone noticing. Never one to give up hope, this morning Little Cat A wondered out loud directly AT me if perhaps the leprechauns might be planning on coming during the day this year instead at night as in previous years. Smart girl. Recycled treats in baggie. 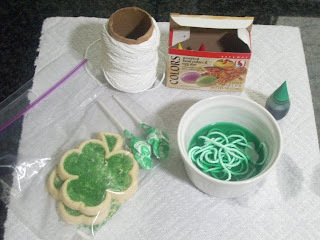 I dyed some string a light green with food coloring. 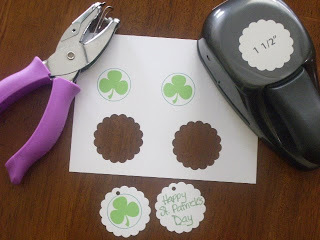 Printed and punched out some shamrocks tags. Wrapped in parchment paper and ready to leave on their pillows. 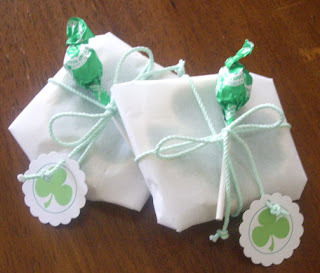 I love your shamrock tags and the effortless wrapping! They looks sooo good!